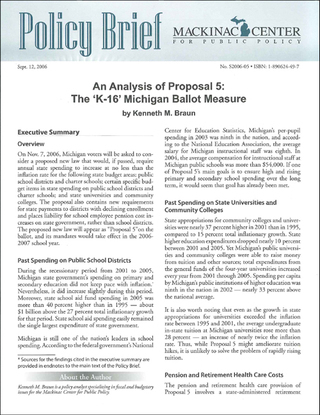 On Nov. 7, 2006, Michigan voters will be asked to consider a proposed new law that would, if passed, require annual state spending to increase at no less than the inflation rate for the following state budget areas: public school districts and charter schools; certain specific budget items in state spending on public school districts and charter schools; and state universities and community colleges. The proposal also contains new requirements for state payments to districts with declining enrollment and places liability for school employee pension cost increases on state government, rather than school districts. The proposed new law will appear as “Proposal 5”on the ballot, and its mandates would take effect in the 2006-2007 school year.